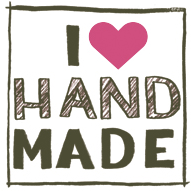 Show Off Market this Friday, Saturday, Sunday!! Calgary welcomed us with open arms and kept the bad weather at bay until Sarah (from Belua Designs) and I had made it safely home. The Inspired Show and Sale hosted by Sabrina O'Donnell of Sabrina Butterfly was great fun and I hope we all do it again it the fall. 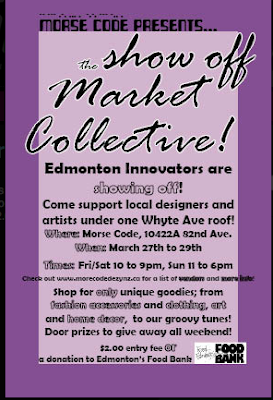 This weekend, I will be set up in Morse Code's retail space for the Show Off Market Collective. Kimberly is turning all of her attention to designing her fabulous clothes and tells me an antique store will soon be moving into her spot on Whyte Ave. In the mean time, she has assembled a pretty impressive group of local designers, craftspeople and artists to sell their goods this Friday, Saturday (10am-9pm) and Sunday (11am-6pm). Morse Code is at 10422A 82 Ave. Door prizes will be given away throughout the weekend, entry is $2.00 OR a donation to the Food Bank.